Our hearing aid system tunes into the church’s sound system, which can help you to hear the rector during the sermon and Holy Eucharist. To request a hearing aid, ask one of the ushers near the church entrance. 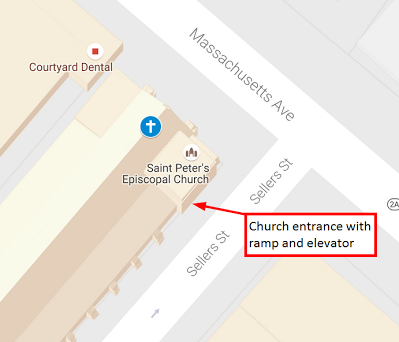 The 13 Sellers Street entrance to the church is equipped with a ramp and a handrail. The church elevator is immediately inside of this entrance. Please ring the doorbell and someone will let you in.